Goffin’s cockatoos pay attention to specific functional features of their tools while they are making them, according to new research. Previous studies showed the birds could spontaneously make long fishing or probing tools by biting them out of different materials, including cardboard. 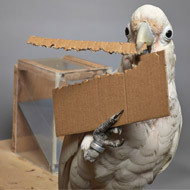 The birds would make parallel bite marks alongside the edge of the material, like a hole puncher, and then use their upper beak to cut the piece out of the cardboard. But a new study published in Plos ONE shows that the birds can adjust the length of their tools as required by cutting longer or shorter sticks out of cardboard - even rejecting those tools they deem unsuitable. In the study, researchers from Vetmeduni Vienna and the University of Vienna found the birds made much longer cardboard strips when a food reward was further away, and shorter strips when food was closer to the probing hole. “If they do make tools that are not long enough to breach the distance between the food reward and the probing hole they usually discard them before even trying to insert them into the box and immediately make a longer one” explains Carina Köck, a student who conducted the study. Researchers said the way the animals showed flexibility in their tool-making behaviour demonstrated they can at least learn to pay attention to different conditions. But whilst the birds were able to adjust the length of their tools, it seemed they were not able to adjust them to the width openings. Even when the diameter of the probing hole varied, the cockatoos continued to make strips of similar width. The team believes the limitation is due to how wide the birds can open their beak. “The lower edge of the upper beak takes a steep curve from the beak tip to the corner of their mouth. The edge of the cardboard block is pressed into the deepest possible point of that curve during tool making,” said Carina.